Christian, Muslim, Jewish faith leaders delivered messages to diverse audience over a Mediterranean dinner at the event. Judaism, Christianity, and Islam. Three Abrahamic religions that worship the tradition of a singular and almighty god, who revealed himself to the prophet Abraham long ago. Despite having this in common, many differences separate the followers of each of these religions based on centuries of conflict and disagreement. Yet on one night, followers of these religions were given the opportunity to be in the same room with one another, brought together by one of the most binding and celebrated aspect of almost any culture: food. That is what the Abrahamic Dinner hosted by the Niagara Foundation and the Kaufman Interfaith Institute offers every year: a chance for members of any faith to come together in one of the most traditional ways‒around a meal. This year, more than one hundred people from various backgrounds and religions shared the opportunity to come and enjoy a buffet of Mediterranean food, as they listened to a set of speeches by three women leaders in the interfaith world. Tables were full of people enjoying various cuisines, such as Shish Kabob, hummus and pita bread, while listening and chatting with people, some of whom they have never met before. Many lively conversations were had in the Temple Emanuel on the Tuesday evening of April 17, whether about faith, or family, or the delicious food. There was a collective feeling of friendship and unity, that reminded people that despite differences, they are all still human, with similar lives and values. As the dinner wrapped up, three women interfaith leaders gave speeches on their faith experiences and their roles in the interfaith community. In the history of the dinner, this was the first time three women speakers headlined the interfaith event. Margarita Solis-Deal, who is a director of the Dominican Center at Marywood, began by telling the story of her faith journey with her mother. Throughout her life, Solis-Deal’s mother has been a great source of wisdom to her, even in her mother’s final days. She has been able to use her faith and spiritual life as a Catholic to make sense of the condition of her mother, who today suffers from Alzheimer's. She said in her speech she recognizes the role of surrendering to the divine, which has let her become at peace with her mother's condition. At the end of her faith journey, it is her mother’s spirit that has spurred her into her interfaith and charitable work. “I along with my interfaith sisters would like to play a part in weaving this interfaith fabric which could be used to make a welcoming shawl to offer hospitality to immigrants and refugees, or used to make a colorful cover for a dinner table used to feed the hungry, or used to make a warm blanket for those who sleep on Division and Fountain street,” Solis-Deal said. Shelby Bruseloff, Student Life coordinator for Hillel Campus Alliance of Michigan, talked about her experiences as being Jewish at Grand Valley State University. When she came to college, she was surprised by how many people were ignorant on the Jewish faith. Even some of her friends said that she was the first Jew they had met. “Throughout my time as an undergraduate, I felt as though I was constantly explaining my religious identity,” Bruseloff said. She became the President of Hillel at GVSU, working to educate people–students and faculty–on Judaism, and to create inclusion for Jews on campus. Zahabia Ahmed-Usmani, the program coordinator for the Kaufman Interfaith Institute, gave her speech on the importance of diversity in the interfaith world. She said without engagement and interaction of people with differing faiths, isolating thoughts and beliefs develops, making people who do not follow the same faith out as “other.” She praised the Kaufman Interfaith Institute’s work in creating affinity groups that unite people among different religions based on common activities, such as watching movies, knitting, and reading books. Still, she said for further progress to be made, effort, trust, vulnerability and time are needed. Ginger Rohwer attended the event after being introduced to the interfaith institute by a faculty member of the same department she teaches in at GVSU. After attending one of the affinity groups offered by the institute, she became curious and supportive of interfaith conversations. “I’ve learned that the efforts in this city are broader than what I realized in the past and that's encouraging to me, but there's still a lot more work to do. Every time I talk to someone of a different faith tradition and I hear stories about what they've endured or what they've gone through, it opens my eyes again and again that we're not there yet,” Rohwer said. 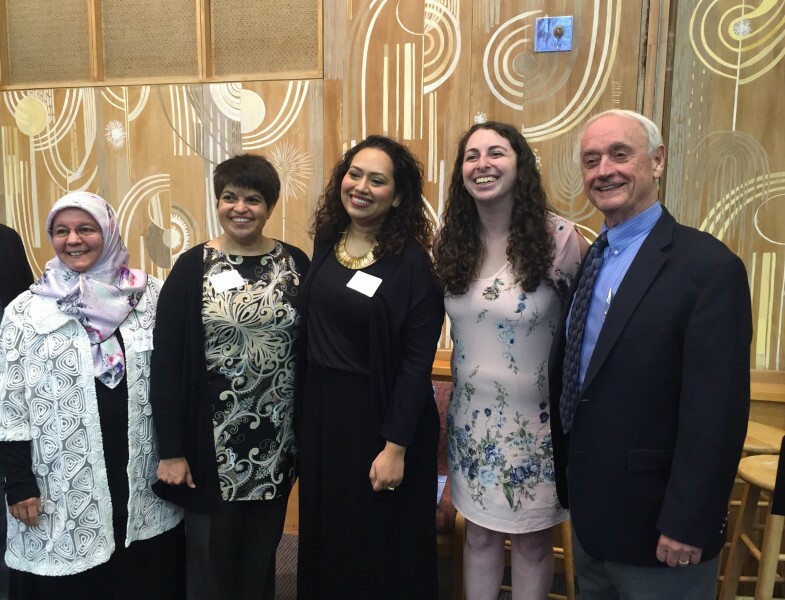 The Abrahamic Dinner is one of many events lined up in the Kaufman Interfaith Institute’s “2018 Year of Interfaith Friendship.” Those interested in more upcoming events or attending one of the affinity groups offered this year can visit the institute’s website.